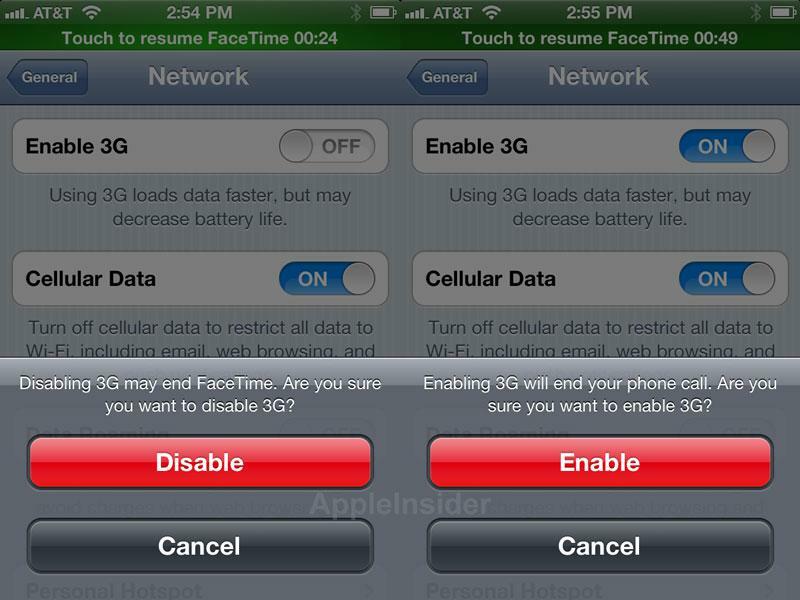 When a FaceTime call is active over Wi-Fi on an iPhone running iOS 5.1.1, and a user turns off the "Enable 3G" option in the Settings application, the operating system presents users with a warning message: "Disabling 3G may end FaceTime. Are you sure you want to disable 3G?" The warning was first noticed by Romanian Apple website iDevice, and publicized on Friday by Gizmodo. Despite the warning, FaceTime video calls will continue over Wi-Fi uninterrupted, even after 3G has been turned off or on, which has suggested to some that Apple is planning to bring 3G support to FaceTime. AppleInsider was able to confirm that the warning message does, in fact, display when the iPhone's 3G is disabled during a FaceTime call. In addition, iOS also displays another message when a user attempts to turn 3G back on: "Enabling 3G will end your phone call. Are you sure you want to enable 3G?" Neither enabling or disabling 3G interrupted any FaceTime calls. Apple first introduced FaceTime video chat in 2010 with the launch of the iPhone 4. Since then, it has been brought to the Mac, and the addition of forward-facing cameras to the iPod touch and iPad have also allowed FaceTime with those iOS-based devices. But since its launch, FaceTime has only been available to use over Wi-Fi. Users who attempt to connect a FaceTime call over 3G are met with an error message telling them the service is not available. When he introduced FaceTime in 2010, Apple co-founder Steve Jobs explained that the video chat feature was not available over wireless cellular networks at the request of mobile carriers. Jobs said that Apple needed to "work a little bit with the cellular providers" in hopes of offering FaceTime over 3G. If Apple does enable FaceTime over 3G, it's possible that some carriers could opt to block or restrict the functionality on their own networks. For example, though tethering was enabled on the iPhone with iOS 3.0, U.S. carrier AT&T blocked the feature until a year later, with the release of iOS 4.0.